Here are some snazzy birthday facts about 18th of June 1958 that no one tells you about. Don’t wait a minute longer and jump in using the content links below. Average read time of 10 minutes. Enjoy! What day was my birthday Jun 18, 1958? June 18, 1958 was a Wednesday and it was the 169th day of the year 1958. It was the 25th Wednesday of that year. The next time you can reuse your old 1958 calendar will be in 2025. Both calendars will be exactly the same! This is assuming you are not interested in the dates for Easter and other irregular holidays that are based on a lunisolar calendar. There are 53 days left before your next birthday. You will be 61 years old when that day comes. There have been 22,227 days from the day you were born up to today. If you’ve been sleeping 8 hours daily since birth, then you have slept a total of 7,409 days or 20.28 years. You spent 33% of your life sleeping. Since night and day always follow each other, there were precisely 753 full moons after you were born up to this day. How many of them did you see? The next full moon that you can see will be on May 18 at 21:13:00 GMT – Saturday. Fun stat: Your first one billion seconds (1,000,000,000) happened sometime on February 24, 1990. If a dog named Mudge - a Italian Greyhound breed, was born on the same date as you then it will be 260 dog years old today. A dog’s first human year is equal to 15 dog years. Dogs age differently depending on breed and size. When you reach the age of 6 Mudge will be 40 dog years old. From that point forward a small-sized dog like Mudge will age 4 dog years for every human year. Battle of Civitate: Three thousand horsemen of Norman Count Humphrey rout the troops of Pope Leo IX. First ascent of Aletschhorn, second summit of the Bernese Alps. William Joyce (“Lord Haw-Haw”) is charged with treason for his pro-German propaganda broadcasting during World War II. President Richard Nixon declares that illegal drugs are “public enemy number one”, which becomes popularized as the “War on Drugs”. The Lockheed F-117 Nighthawk, the first operational aircraft initially designed around stealth technology, makes its first flight. What does my birthday June 18, 1958 mean? 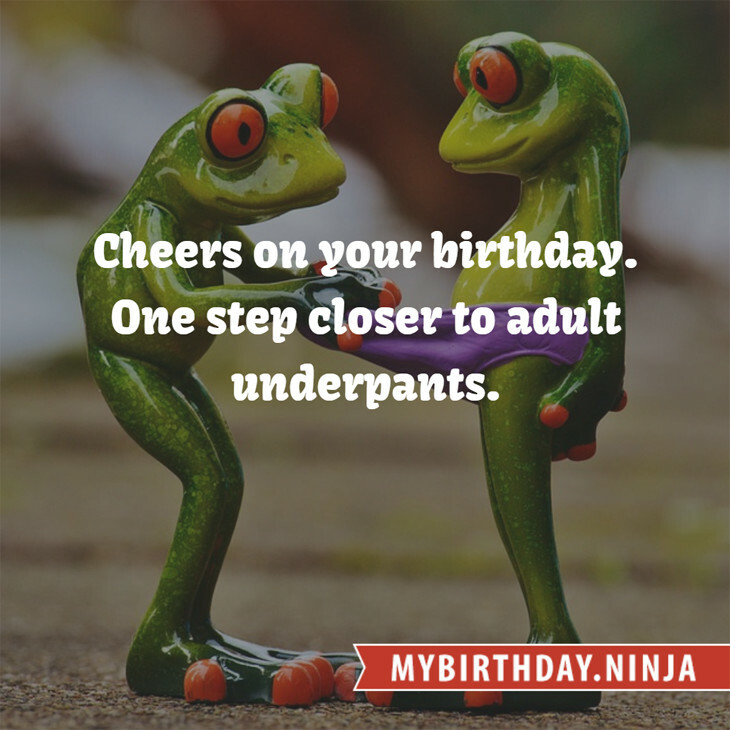 Your birthday numbers 6, 18, and 1958 reveal that your Life Path number is 2. It represents balance, harmony and partnership. You have the soul of an artist. You are a fine companion and possess a good sense of humor. Friends seek you out for your calming and peaceful company. The following celebrities also have the same life path number: Dharmendra, Zoe McLellan, Kelsey Chow, Rebecca Gayheart, Chill Wills, Carrie Keagan, Lee Hyeri, Madonna, Kim Alexis, Gene Watson. 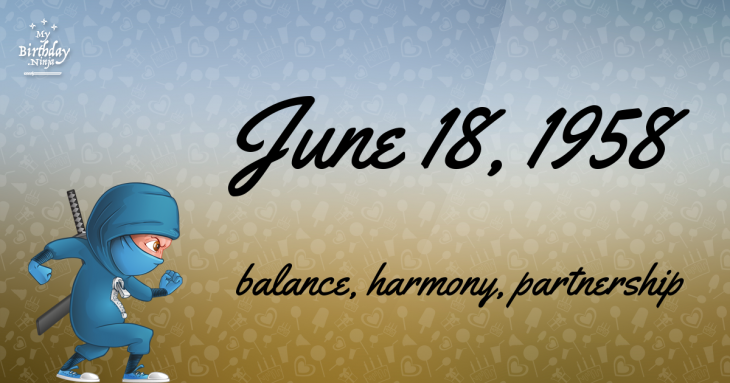 What is the birthday horoscope for Jun 18, 1958? The Western zodiac or sun sign of a person born on June 18 is Gemini ♊ (The Twins) – a mutable sign with Air as Western element. The ruling planet is Mercury – the planet of communication. According to the ancient art of Chinese astrology (or Eastern zodiac), Dog is the mythical animal and Earth is the Eastern element of a person born on June 18, 1958. Fun fact: The birth flower for 18th June 1958 is Rose for devotion. What is the Love Match for Jun 18, 1958? When it comes to love and relationship, you are most compatible with a person born on October 14, 1965. You have a Love Match compatibility score of +149. Imagine being in love with your soul mate. On the negative side, you are most incompatible with a person born on October 9, 1969. Your incompatibility score is -154. You’ll be like a cat and a dog on a love-hate relationship. Arf-arf, I want to bite you. Meow-meow, stay away from me! How many babies were born on June 18, 1958? Base on the data published by the United Nations Population Division, an estimated 103,731,629 babies were born throughout the world in the year 1958. The estimated number of babies born on 18th June 1958 is 284,196. That’s equivalent to 197 babies every minute. Try to imagine if all of them are crying at the same time. What is the popular baby name on 18 Jun 1958? Here’s a quick list of all the fun birthday facts about June 18, 1958. Celebrities, famous birthdays, historical events, and past life were excluded. Try another birth date of someone you know or try the birthday of these celebrities: August 23, 1977 – Jelena Rozga, Croatian singer (Magazin); July 29, 1965 – Dean Haglund, Canadian actor, producer, and screenwriter; April 16, 1933 – Ike Pappas, American journalist and actor (d. 2008).